[THE INVESTOR] Hyundai Motor plans to unveil a new fuel-cell electric vehicle with a price tag of 60 million won (US$53,400), around half the price of the current Hyundai Tucson Fuel Cell. Despite the cheaper price tag, the driving range will be extended from the current 415 kilometers on a single charge to 600 kilometers, the carmaker said. The plan was unveiled during the launch event of a government-industry alliance that kicked off Aug. 24 with aims for 10,000 fuel-cell vehicles on the road by 2020. Hyundai, the nation’s largest carmaker and No. 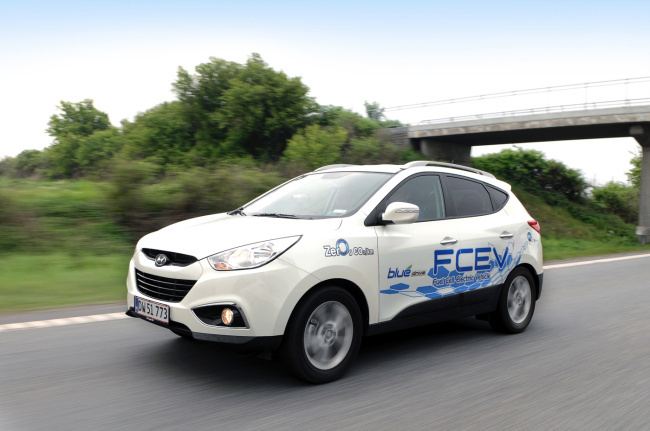 5 globally, was the first to commercialize a fuel-cell vehicle, based on its Tucson compact SUV, in 2013. The car uses a fuel cell, instead of an engine, to power its on-board electric motor. It is a zero-emissions vehicle that emits only water and heat. But the high price tag and a lack of charging stations have hampered its wider adoption. The first-generation model, priced at 85 million won, has sold 544 units globally, including 77 in Korea. The Korean government plans to increase tax benefits to customers with aims to increase the number of fuel-cell vehicles to 10,000 in Korea by 2020, while exporting 14,000 vehicles outside the nation. Hyundai added it would unveil the world’s first fuel-cell bus by the end of this year.